The catchment management group was formed largely to oversee the development of an ecologically sound drainage strategy. Our philosophy is that those who actually live in a catchment should be involved in its management. Over the following three-year period, YYCMG carried out a number of on-ground trials and feasibility studies to set up a regional drainage scheme. Detailed elevation data for the ‘priority subcatchments’ (LINK) were obtained with a quad-mounted RTK system, operated by YYCMG’s in-house surveyor. 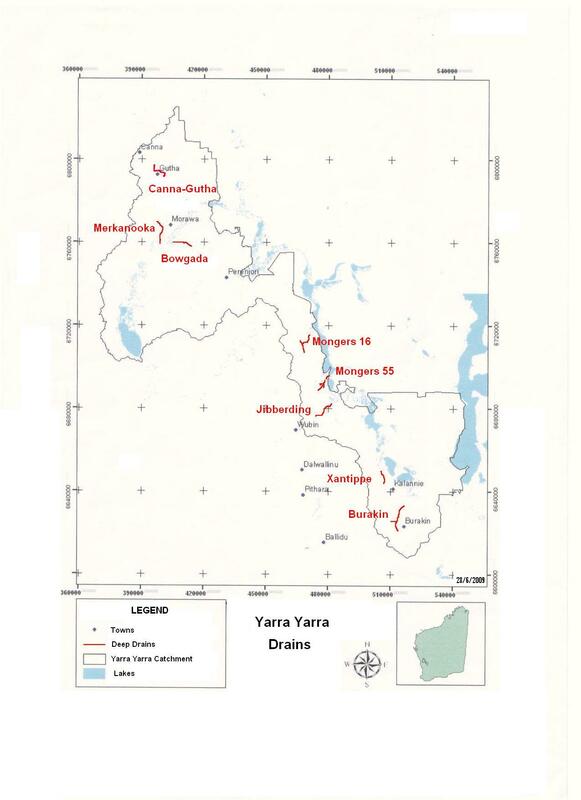 The feasibility work was completed and reported in 2005 (LINK). YYCMG then submitted a project plan for about 500 km of deep drains to be excavated in three stages, involving subcatchments in all but one of the 11 zones. The first stage would be treated as a research project. It would be closely monitored to assess drain flow, groundwater levels, water/sediment/soil quality, and environmental impacts in the discharge wetlands. 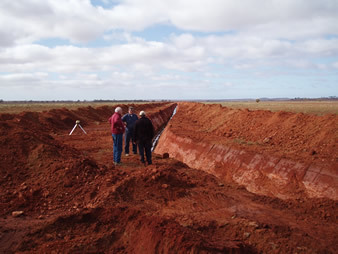 A demonstration drain was excavated during the dry winter of 2006 to link four properties in the Mongers 55 subcatchment (LINK). The design was a double-leveed, groundwater drain, with a shallow surface-water drain on either side. 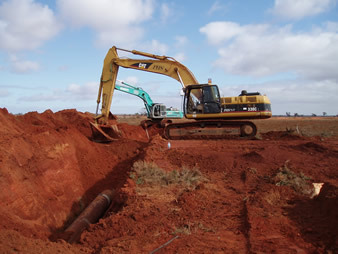 Through a complex system of buried pipes and cross-overs, groundwater and surface water were kept apart until being discharged together into a shallow dispersion lake. These combined earthworks formed the core of a 100 m-wide corridor, which has been fenced to exclude stock, and is being progressively revegetated with salt-tolerant plants, such as melaleucas and chenopods. As the groundwater table continues to fall and soils become less saline and less sodic, we hope to introduce less-specialist plants, such as eucalypts, wattles and sandalwood, into these rehabilitated valley- floor sites. In 2007 and 2008, YYCMG received funding from the National Action Plan for Salinity and Water Quality (NAP) to initiate similar drainage systems in a further seven subcatchments. This completed Stage I of the formal three-stage plan. It was followed in 2009 by further excavations in the West Morawa 41 (or ‘Merkanooka’) subcatchment. The 2009 work did not conform to our submitted plan, nor to our prioritisation policy. It was dictated by the regional NMR agency, which distributes and administers government funds. Preliminary results on the effectiveness and environmental impacts of deep drains in the Yarra Yarra catchment have been presented at a number of local fora over the past three years. The results to date (which might turn out to be ‘final’ results if funding is not made available to continue monitoring) are currently being assembled. Raw data from our monitoring program are posted on this website.